Plan with photographs of cup and ring marks at High Banks. Photograph of cup and ring markings. (NX 710 490) Several groups of cup-and-ring markings occur on an exposure of rock 1/4 mile SE of High Banks 97' long facing WNW, and running NNE-SSW (see illustrations, which show three of four casts of parts of this rock which are in the NMAS). The rock is situated 40 yds from the SW wall, 150 yds from the NE wall. 3yds W of the summit of the knoll on which these marks are situated are two lines of 4 and 5 cups respectively. The above cup-and-ring marked rocks were located at NX 7091 4895. About 10m SSW of the main group of inscriptions is an isolated cup and two rings, 11cm in diameter and broken off at the rock's edge. It slopes 33 to the S. Some 250cm W of the main group of engravings is an outcrop sloping 4 degrees N with a cupmark surrounded by three very faint rings and some eleven small cups. Only 320cm W of quarry is an outcrop sloping 5 degrees N having a cup and two incomplete rings and two single cups, one of which has faint traces of two rings. A complete ground plan of the whole site will be available shortly. More carvings have been noted recently. M A M Van Hoeck 1986. One of the best displays of prehistoric rock art in Galloway, this rock sheet, about 30m long, bears several groups of cups and cups-and-rings. Some of the ringed cups are set within a fIeld of massed simple cups, and their outer rings are widely spaced. The greatest ring diameter is 0.45m. 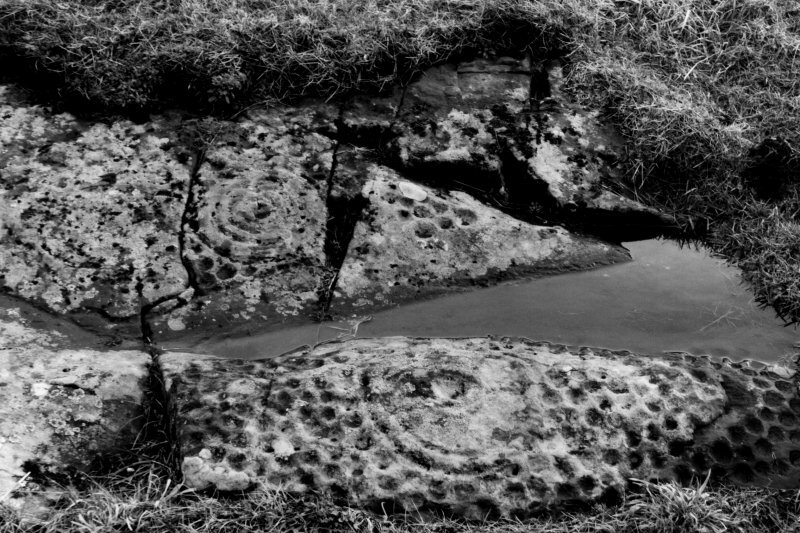 Casts of this remarkable pattern are exhibited in the Stewartry Museum, Kirkcudbright, which also houses cup-and-ring marked slabs from Blackmyre (NX 497570) and Laggan (NX 5453).